A highlight of any visit to the Valley is canoeing or kayaking down the River Wye on a warm summer’s day. From the surface of the water you get an impeccably peaceful vista of the green fields and tree clad hills along the banks of the Wye together with the river’s animal life including peregrine falcons, salmon, buzzards, otters, swans, ducks and herons. Canoes can be rented in Monmouth or Symonds Yat. Monmouth Canoe & Activity Centre offer half and full day hire of canoes or kayaks and will arrange transport further up the River Wye and allow you to paddle back to Monmouth. Here they will greet you and help remove your canoes from the water and return them to the centre, a short walk away. Symonds Yat Canoe Hire, Ross-on-Wye Canoe Hire and Wyedean Canoe Hire are all centred around Symonds Yat, a popular stretch of the river which sports some rapids and plenty of refreshment stops. 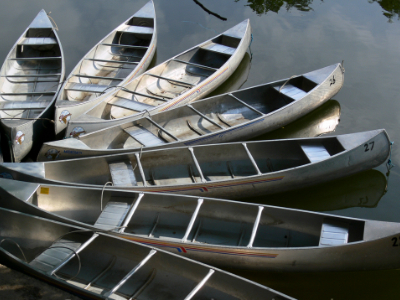 All canoe hire centres will recommend itineraries and arrange drop-offs and pick-ups.